Since it is summer I had a hankerin’ for a chopped salad. Like any good technophile I turned to Google to find a good one near me, which is how I discovered Chop It Salad Co. 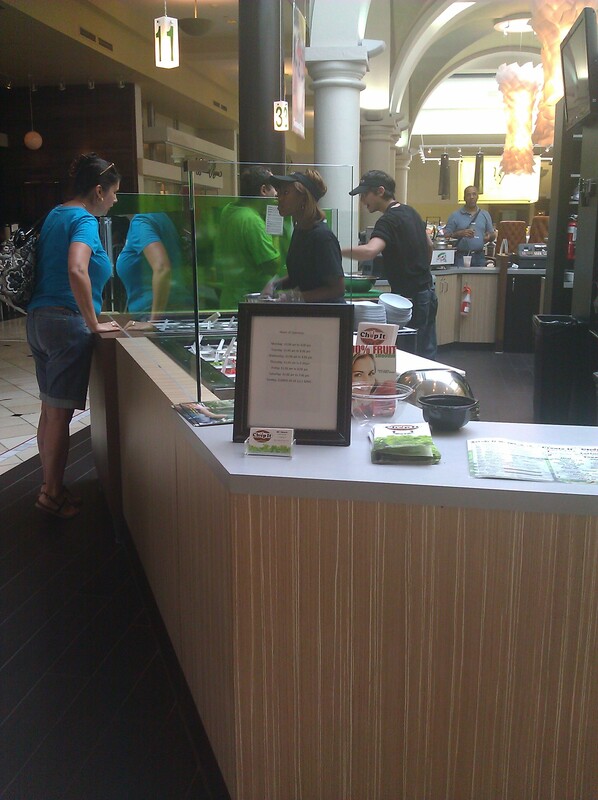 It is located in the atrium of Eton Center in Woodmere. In fact, you can watch the folks at B Spot eat their burgers and drink those delicious milkshakes while knowing you are eating somewhat healthy. Chop It Salad Co. allows you to order off the pre-designed Signature Menu (which is what I did since I was craving a good Cobb salad) or create your own salad or wrap with “Unlimited Toppings”! If you choose the latter option, you first choose your lettuce mixture between romaine, iceberg, spring mix or spinach and then choose from their over 50 toppings of meats, cheeses, shrimp, eggs, and veggies. I wanted a Cobb salad, but I asked for Honey Mustard dressing instead of the default Bleu Cheese or Ranch dressing. My Cobb salad was made of iceberg and romaine lettuce, grilled chicken, bacon, cheddar cheese, crumbled blue cheese, avocado, hard boiled egg, tomatoes and black olives. It was accompanied by a thin slice of pita bread. I ordered a fountain drink to go with it and was told I could get a free refill at any time by bringing my glass back up to the register. 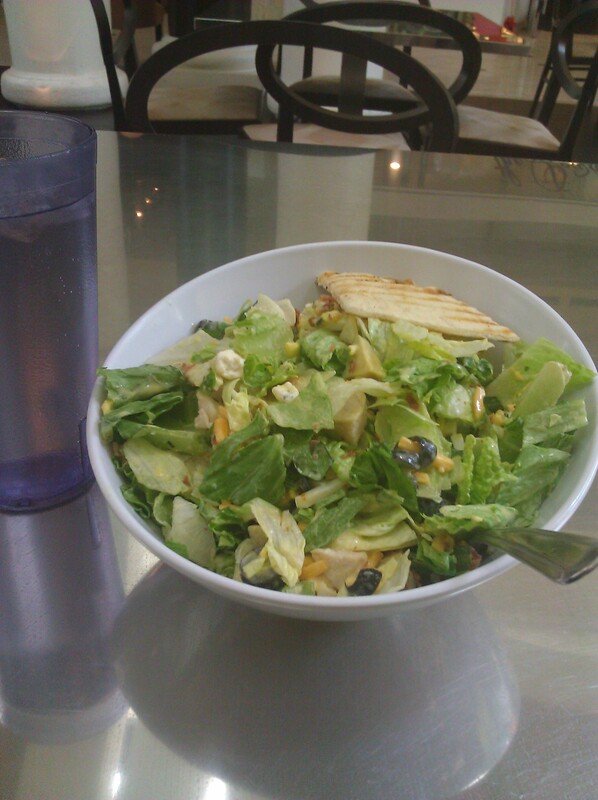 My salad was made quickly by the helpful chopper, and after I paid for it at the register (the total was around $11 for the salad and large beverage) I found a cozy upholstered chair in the center of the atrium where I enjoyed my salad and did some people watching. 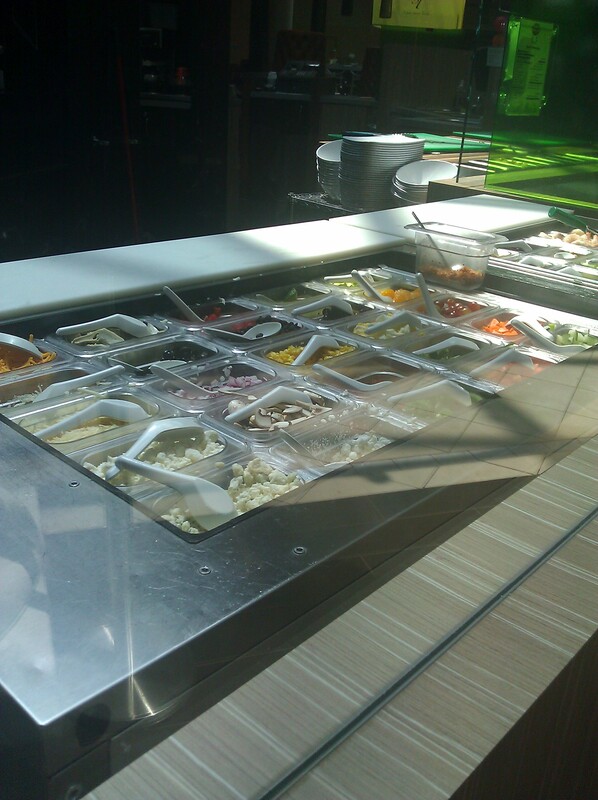 So if you are in the Woodmere area and want to enjoy a refreshing chopped salad or wrap give Chop It Salad a try. They also have locations in Southpark Center (500 Southpark Ctr, Strongsville, OH 44136) and the food courts at Great Northern Mall and Belden Village Mall.